in a spangled jangle of shards like a spilled sheet of ice. This crash. breaking open to let something else in? expectations, I’d sometimes close my eyes and think about that kiss . . .
the skillet of my stomach. like socks in a dryer. seems too much to hold inside. pected, too much like something you knew you wanted too much. ever yours to break in the first place. This selection comes from Lee Ann Roripaugh’s book Dandarians, available from Milkweed Editions. Purchase your copy here! 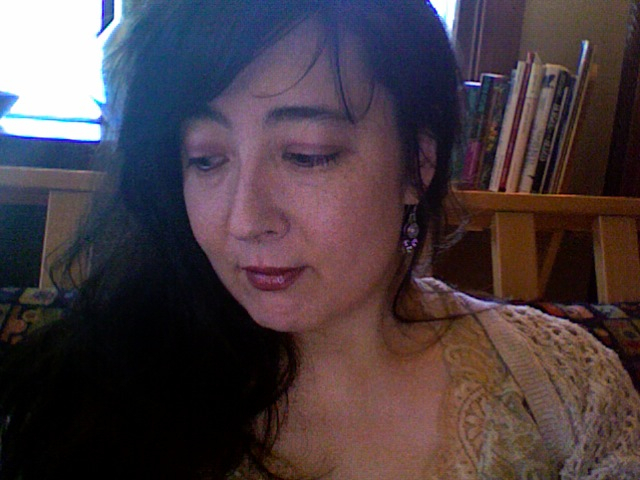 Lee Ann Roripaugh is the author of four volumes of poetry, the most recent of which, Dandarians, was released by Milkweed Editions in September 2014. Her second volume, Year of the Snake (Southern Illinois University Press), was named winner of the Association of Asian American Studies Book Award in Poetry/Prose for 2004, and her first book, Beyond Heart Mountain (Penguin Books), was a 1998 winner of the National Poetry Series. The recipient of a 2003 Archibald Bush Foundation Individual Artist Fellowship, she was also named the 2004 winner of the Prairie Schooner Strousse Award, the 2001 winner of the Frederick Manfred Award for Best Creative Writing awarded by the Western Literature Association, and the 1995 winner of the Randall Jarrell International Poetry Prize. Her short stories have been shortlisted as stories of note in the Pushcart Prize anthologies, and two of her essays have been shortlisted as essays of note for the Best American Essays anthology. Her poetry and short stories have appeared in numerous journals and anthologies. Roripaugh is currently a Professor of English at the University of South Dakota, where she serves as Director of Creative Writing and Editor-in-Chief of South Dakota Review. She is also a faculty mentor for the University of Nebraska low-residency M.F.A. in Writing, and served as a 2012 Kundiman faculty mentor alongside Li-Young Lee and Srikanth Reddy. Jennifer Jackson Berry is the author of the chapbooks When I Was a Girl (Sundress Publications) and Nothing But Candy (Liquid Paper Press). Recent poems have appeared or are forthcoming in Booth, The Emerson Review, Harpur Palate, Moon City Review, Stirring, and Whiskey Island, among others. She lives in Pittsburgh, Pennsylvania.